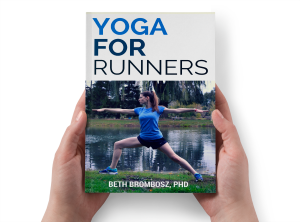 I’ve written before about how beneficial yoga is for runners as a whole. 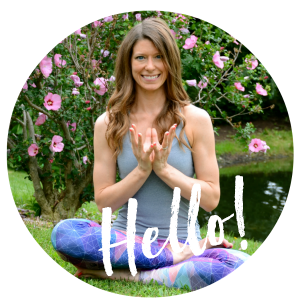 Yoga can really help you strengthen weak areas and help prevent injuries, not to mention the mental benefits a yoga practice can give your running. 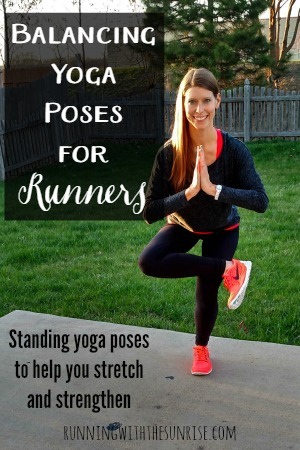 Today, I’m focusing on balancing yoga poses for runners, why balancing poses are so great for runners and which ones you should try. Why should runners practice balancing? Balancing yoga poses are really great for strengthening stabilizer muscles, especially in the standing leg. They’ll help strengthen your foot and your ankle, which will reduce your risk of getting sprains when you misstep. Strengthening your arch can help reduce your risk of getting the dreaded plantar fasciitis. And, balancing will strengthen the rest of your leg, your hips, and your core. Balancing will also help you improve your mental focus, since a lot of focus is required to hold balancing poses for a longer period of time. Runners! Do you know the benefits of balancing yoga for running? 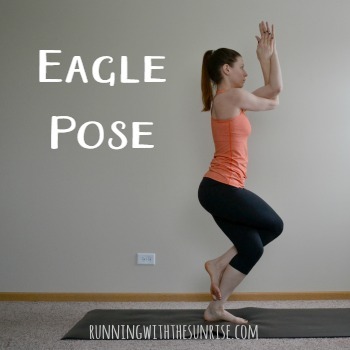 Eagle pose not only strengthens the ankle and foot, but it’s also a good stretch for the Achilles and ankle of the standing leg. If you’re just starting to work on balancing poses, keep the toes of the top leg on the ground next to the outside of your standing leg as a kickstand. As you get better at this pose, start to lift the toes of the top leg off the ground and gradually work on wrapping the foot around your standing ankle. If you have tight shoulders, skip the arm variation I’m showing and just give yourself a bear hug. 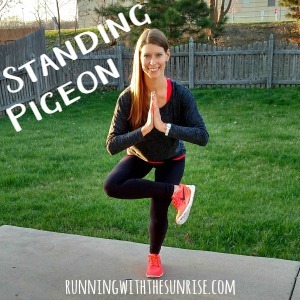 Standing pigeon is one of my very favorite yoga poses for runners because you get to stretch through the hip and glute of the non-standing leg, places where runners tend to get really tight. You’re stretching many of the same muscles you stretch in regular pigeon pose with the added benefit of strenthening your ankle and foot. Be sure you’re pulling your belly button to your spine to take any curve out of the low back. Really flex through the foot of the top leg and sink lower to intensify the stretch. Think about pulling the top knee down and back, too, if you want to deepen the stretch a little more. 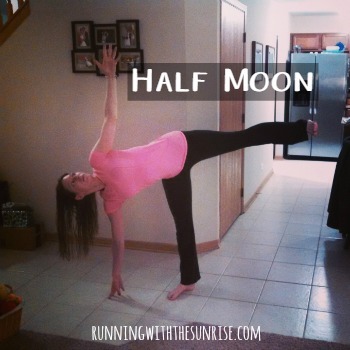 I love practicing half moon in the same session as standing pigeon because half moon helps open the hips in a different direction. Really squaring the hips off to the side will help you get a really nice stretch in this pose. And, really flexing through the top leg and keeping it straight will help strengthen your glutes, especially in that top leg. Weak glutes can lead to some hip injuries, like the hip flexor injury that kept me from running for a few months back in 2012. Give your glutes some love, runners! Runner-yogis: What are your favorite standing balancing poses? Do you work on strengthening your ankles or hips? Standing pigeon is one of my favorites; it’s really hard to balance with weak hips! It’s one of my favorites, too. Whenever I have students saying they have tight hips, I always do this pose in my classes. It feels so good! Tree pose is awesome! I love how there are so many different variations of tree, so you never feel like you’re doing the same pose. Increasing my stability has made SUCH a huge difference for my running-=-runners NEED these! Preachin’ to the choir, here! Strengthening my stabilizer muscles has really helped me to run injury free. And it just helps you be a better runner by making you stronger and helping you hold good form! Yes, it is all about the core! Glad your bound half moon is coming along! That’s a tough pose to master! Great post, as always! Loving the simple and easy-to-read information. Great poses here! My favorite workout is a quick run followed by yoga. The yoga alone is amazing but I find that running first makes my mat time so much better. And the stretching feels so beneficial. Thanks for sharing! Thanks! I am a huge fan of yoga after running, too. I actually used to schedule my runs and yoga classes around that when my schedule was more flexible!